According to one of the plaques, “Remember the Alamo!” were the words General Sam Houston’s soldiers shouted at Antonio Lpez de Santa Anna’s Mexican army during the Battle of San Jacinto. But walking around the Alamo itself, I was thinking that I might be remembering this city—San Antonio—for a whole different mismatched battle. On one hand, Kia had brought us here to sample its all-new Niro hybrid, capable of touching 50 mpg on the highway. On the other, it’s the headquarters of Valero Energy, Tesoro Corporation, and NuStar Energy, a trio of oil behemoths. Talk about being surrounded by the local unfriendlies. Except the Niro isn’t. To my surprise, Texas is actually the third-largest hybrid market in the country despite being the No. 2 market for pickups. Sure, with gas prices around $2.35 per gallon, now might not seem like it’s the best time to buy a hybrid vehicle. Kia obviously thinks the contrary. By calling it a crossover, the Korean brand also wants to get in the minds of the consumer wanting more utility. We all know crossover sales are booming, and part of their likeability is their higher ride height and boxy, useable interior space. But after spending a full day driving the Niro in Texas Hill Country, the question stuck in my head was whether it is really a crossover. That design—useful or not—is still Kia’s strongest selling point: a hybrid that doesn’t look hybrid (or the un-hybrid, like they call it). Its short overhangs, extended roofline, and wide stance give the Niro a look that other dedicated hybrids just don’t have. Think about the styling of the Prius—lots of potential buyers are turned off by it. And that’s exactly who Kia is going after. The brand wasn’t shy to say that they want a slice of the Prius pie, and with more power and better looks, the Niro has a shot at forking up a mouthful. Kia’s target was getting 50 mpg combined, and we have the EPA official numbers: The base model FE returns 52/49/50 mpg city/highway/combined. The LX and EX versions get 51/46/49, and the Touring and Touring Launch deliver 46/40/43. Kia told us that the weight difference between the FE and Touring models is the source of that mpg drop. For instance, the Touring and Touring Launch get 18-inch alloy wheels, but all other versions receive 16-inch wheels. If you add leather seats, a premium audio system, and other equipment, the Touring model will be about 170 pounds heavier than the FE. Inside the cabin, you’ll be greeted by an 8.0-inch screen with the UVO3 infotainment system, which supports Apple CarPlay and Android Auto. UVO3 seemed a little slow to respond, and its input beeps can get old pretty quickly. Frankly, it could use better response and updated graphics. Contrasting with our Deep Cerulean Metallic Niro, the interior had blue stitching on its seats, door panels, center console, and gearshift, and the air vents had a blue-colored frame that added some snazziness. In terms of safety, you’ll find a blind-spot detection system, lane departure warning, smart cruise control, autonomous emergency braking, and a park assist system in the Touring grade. 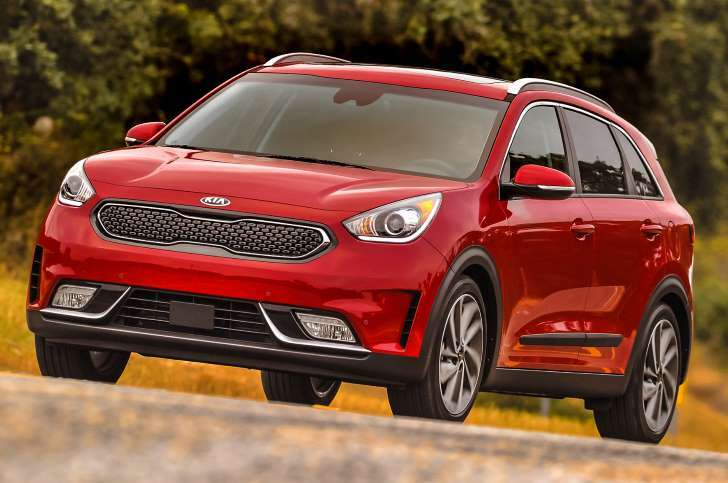 Kia expects top crash ratings from both the IIHS and NHTSA. Pricing is still not finalized, but we were told that once it hits the market in mid-January, it will start under $23,000 for the FE model and that the fully equipped Touring version should be right around $32,000. That’s exactly what they’ll need to tackle the Prius, which starts at $24,685 and can get up to $30,000. Sam Houston and his army were the underdogs in the Battle of San Jacinto. Although outnumbered by Mexicans, knowledge of the terrain and the right strategy won the day. Kia has a solid strategy, but time will tell whether the Niro wins a piece of the hybrid market.